A new international trailer has been released for the much buzzed about Bridge of Spies starring Tom Hanks. The trailer features many of the same footage as before with a few new scenes included. 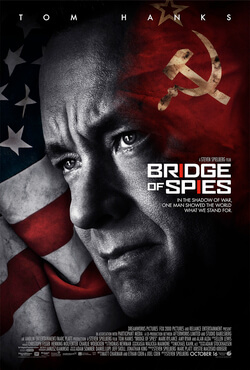 The movie is based on a true story set in 1957, during the decades long cold war. The movie focuses on James Donovan (Hanks) an insurance lawyer from Brooklyn who is asked to take on the greatest case of his life. He is tasked with defending a suspected Soviet spy in the midst of all the high tensions that went on during this period. The CIA then sends him on what is seemingly an impossible mission, to arrange the swap of their prisoner for the release of an American U-2 pilot who was shot down and captured by the Russians.